Come Visit Our Salon For Your Prom Hairstyle! Our salon offers prom pampering services! Are you planning for that special	day you’ve been waiting all school year for? Perhaps you’ve	already found the perfect dress, but what about your hair? 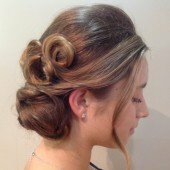 Prom is a big	occasion and certainly deserves a trip to our salon and spa! Have the perfect hairstyle in mind already? Our expert hairstylists can	give you the look you want! Still trying to decide? Don’t worry! 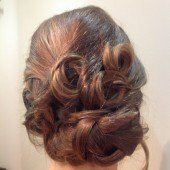 We can recommend a style that will work great with your hair and go great	with your dress! 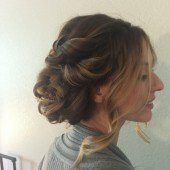 Updos are usually most popular for prom. Imagine your hair looking gorgeous	pinned up in curls. We can also do half up half down styles, or if you	want your hair all down we can do that too. Envision your hair in beachy	waves or gorgeous braids. 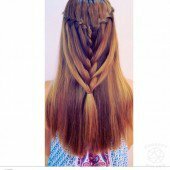 Whatever look you want, we can create a beautiful	hairstyle that will stay in place all night! Looking for more? Before we style your hair for prom, you may want to get	a fresh haircut or liven up your color. From balayage to hair smoothing	and luxury treatments, we can do it all! Stop stressing and let us take	care of your hair the day of prom. You’ll enjoy relaxing in our	welcoming salon and spa as you prep for your big night. Please show up to your prom appointment with clean dry hair. Avoid using a flat iron after washing so your hair will hold its curl and style. 10% first time discount does not apply for prom hair or make up. 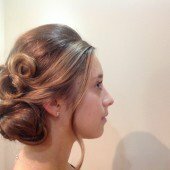 Check out our photos below to see prom styles we have done in the past! Visit our salon before prom! 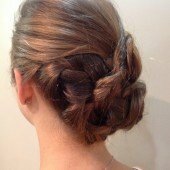 Our hairstylists create beautiful prom hairstyles	that will last all night long! Not all hair salons offer all the prom	services we do. In addition to hairstyles, cuts, and colors, we also do	manicures, pedicures, facials, spray tanning, and more! Check out our	prom packages on our	specials page. Call us today at 603-232-3448.